Treosulfan (dihydroxybusulfan), licensed for the treatment of ovarian carcinoma, is investigated in clinical trials as a myeloablative agent for conditioning prior to hematopoietic stem cell transplantation. Clinical experience shows that treosulfan exhibits lower organ toxicity than busulfan, including hepatotoxicity. Elimination of busulfan primarily via enzymatic conjugation with glutathione (GSH) in the liver is considered to be the main cause of the drug’s hepatotoxicity and interpatient clearance variability. It is believed that treosulfan undergoes no hepatic metabolism but empirical evidence is lacking. The aim of this kinetic study was to verify if treosulfan is capable of conjugating with GSH. Treosulfan (200 μM) was incubated at pH 7.2 and 37 °C with 5 mM GSH in the presence or absence of human liver cytosol, the main store of glutathione S-transferase in the body. Concentrations of treosulfan were determined using liquid chromatography–tandem mass spectrometry and then subjected to kinetic analysis. The decay of treosulfan in the solution followed a one-exponential model in the presence of either GSH or liver cytosol and GSH. The first-order reaction rate constants (0.25 h−1) did not differ statistically from those found for treosulfan conversion in pH 7.2 buffer only. Treosulfan does not undergo either spontaneous or enzymatic conjugation with GSH at a noticeable rate. The result indicates that the clearance of treosulfan is independent of glutathione S-transferase activity, GSH stores, and co-administration of drugs utilizing the GSH metabolic pathway. Treosulfan does not undergo either nonenzymatic or human liver cytosol glutathione S-transferase-mediated conjugation with glutathione. Glutathione S-transferase activity and GSH stores should not influence the clearance of treosulfan. Treosulfan (dihydroxybusulfan, Fig. 1) is licensed in several European countries for the treatment of advanced ovarian carcinoma . Unlike busulfan, treosulfan is a prodrug in which biological activity relies upon a nonenzymatic pH-dependent conversion to DNA alkylating epoxides—(2S,3S)-1,2-epoxybutane-3,4-diol 4-methanesulfonate (EBDM) and (2S,3S)-1,2:3,4-diepoxybutane (DEB) [2, 3, 4]. For the past two decades, treosulfan has been increasingly used worldwide in a clinical trial setting in conditioning prior to hematopoietic stem cell transplantation (HSCT) as an alternative to busulfan, especially in children and high-risk patients [5, 6, 7]. The key rationale for this application is low organ toxicity, including hepatotoxicity, of the myeloablative doses of treosulfan compared with busulfan [5, 6, 7, 8, 9]. It is well known that busulfan undergoes elimination from the body primarily via enzymatic conjugation with glutathione (GSH) . 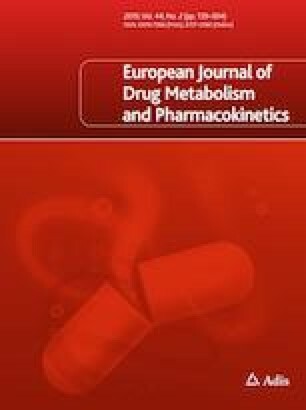 The polymorphism of glutathione S-transferase (GST), changes in enzyme activity with age, and the co-administration of drugs being substrates, inducers or inhibitors of GST are considered to be the main sources of the interpatient variability of intravenous busulfan clearance [8, 9, 11]. Therapeutic drug monitoring and personalized drug dosing are recommended for any use of busulfan in conditioning regimens prior to HSCT . According to current knowledge, elimination of treosulfan involves its nonenzymatic conversion to EBDM and DEB, and renal excretion of the unchanged prodrug . Nevertheless, the interpatient variability of treosulfan clearance in HSCT patients after intravenous infusion of high doses (10–14 g/m2) is rather appreciable, particularly in children [13, 14]. Following oral administration of a dose of 1 g/m2 to adult females with ovarian cancer, the prodrug had almost complete bioavailability (97 ± 3%) . The negligible first-pass effect suggests that, despite a structural similarity to busulfan, treosulfan undergoes no hepatic metabolism, but empirical evidence for this claim has not been provided to date . Therefore, the aim of our study was to examine treosulfan–GSH conjugation in the presence or absence of a human liver cytosol, the main store of GST. Treosulfan was kindly supplied by Medac GmbH (Wedel, Germany). Human liver cytosol (20 mg protein/1 mL preparation in phosphate buffer), pooled from 46 adult donors representing different genders and race, was purchased from Life Technologies. GSH and racemic DEB, used as a positive control for testing the liver fraction activity, were obtained from Sigma-Aldrich. Acetonitrile and methanol, liquid chromatography (LC) gradient grade purity, and formic acid for LC were from Merck. Other chemicals, all of analytical grade, were also obtained from commercial suppliers. Demineralized water at a conductivity of 0.1 μS/cm, prepared in a deionizer and filtered through a 0.45-μm cellulose membrane filter, was always used. To prepare a phosphate buffer saline (PBS), 1.16 g KCl, 0.077 g KH2PO4, and 0.286 g Na2HPO4 were successively dissolved in 98 mL of water in a beaker. After 24 h, the solution was placed in a water bath at 37 °C, and adjusted to pH 7.18 by the addition of 1 M HCl. After reaching room temperature, the buffer was filled with water to 100 mL in a volumetric flask. The ionic strength of the PBS was 0.22 M. Following 10% dilution with water, the solution changed its pH to 7.20 and lowered the ionic strength to 0.20 M, which provided the desired conditions for an in vitro metabolic study. It was found that 5 mM GSH decreases the buffer pH from 7.20 to 6.79, and the addition of 5.45 μL of 1 M NaOH per 1 mL of the solution is required to compensate for the GSH effect. A mixture of 350 μL of pH 7.18 phosphate buffer (n = 3), 20 μL of freshly prepared 100 mM GSH in water, 2.1 μL of 1 M NaOH, and 10 μL of human liver cytosol was maintained at 37 °C in a water bath, and the reaction was initiated by spiking with 20 μL of the aqueous solution of 4 mM treosulfan. As a result, the solution contained 200 μM treosulfan, 0.5 mg/mL cytosolic proteins, and 5 mM GSH. Samples (40 μL) for kinetic analysis were collected at 0, 0.25, 0.5, 1.0, 1.5, and 2.0 h into vials containing 10 μL of 75 mM citric acid to lower the pH to 4.6, and thus prevent the artificial activation of treosulfan. To precipitate proteins, 60 μL of methanol was added and the content was vortexed. Then, 10 μL of water and 10 μL of 0.5 mM aqueous solution of codeine (internal standard) were spiked. The samples were centrifuged at 14,000 g at 4 °C, for 5 min, and the supernatant was analyzed with liquid chromatography–tandem mass spectrometry (LC–MS/MS). A positive control of the cytosol was carried out by incubating for 2 h with 250 μM racemic DEB under the aforementioned conditions. A 2.3-fold drop of the compound concentration (results not shown) was observed, which confirmed the enzymatic activity of the cytosol GST . The nonenzymatic conjugation of treosulfan with GSH was examined in an analogous way as the enzymatic reaction, except 10 μL of the cytosol in the reaction mixture was replaced with 10 μL of the PBS. The collected samples (40 μL) were treated with 10 μL of 50 mM citric acid, 70 μL of water, and 10 μL of the codeine solution, and then subjected to the LC–MS/MS assay. To determine the GSH-independent decay of treosulfan, the prodrug was incubated in only pH 7.2 PBS at 37 °C. For that purpose, 360 μL of PBS was mixed with 20 μL of water, and then spiked with 20 μL of 4 mM treosulfan. The collected samples (40 μL) were treated with 10 μL of 50 mM citric acid, 70 μL of water, and 10 μL of the codeine solution. The analysis was accomplished in Agilent 1260 apparatus coupled to Agilent 6410B Triple Quad. A Zorbax Eclipse Plus C18 column (2.1 × 100 mm; 3.5 µm particle size) guarded by an Eclipse Plus C18 precolumn, both from Agilent, was maintained at 25 °C. The mobile phase consisted of 10 mM ammonium formate–formic acid buffer, pH 4.0 (eluent A) and acetonitrile (eluent B), and its flow was set at 0.5 mL/min. The following elution gradient program was used—0 min, 5% B; 2.0 min, 5% B; 10.0 min, 90% B; 10.1 min, 5% B; 14.0 min, 5% B. The injection volume was 5 μL. Ionization was accomplished with an electrospray interface working in a positive mode. Ionization source settings were capillary voltage 2000 V, nebulizer gas pressure 60 psi (N2), dry gas flow 10 L/min (N2), and dry gas temperature 350 °C. The detection was processed in a multiple reaction monitoring (MRM) mode using the following mass transitions—treosulfan 296.0 → 183.2 (5 eV), 296.0 → 278.7 (1 eV), 296.0 → 87.0 (10 eV); codeine 300.0 → 165.0 (45 eV), 300.0 → 215.0 (25 eV); transitions used for quantification are shown in bold and collision energies are given in brackets. The fragmentor voltage for the quantification of treosulfan and codeine was set at 94 and 130 V, respectively. The MassHunter workstation software (Agilent Technologies, USA) was used for instrument control, data acquisition and data analysis. Calibration samples were prepared in a similar way to the samples collected during the kinetic study, except the citric acid-acidified drug-free suspension of the liver fraction in the phosphate buffer was spiked with 10 μL of the standard solution of treosulfan instead of 10 μL of water. Kinetic analysis was carried out using Excel 2010 (Microsoft Corporation). Rate constants for the decay of treosulfan in the studied samples were calculated from the slope of the linear plot of the natural logarithm of the treosulfan concentration versus time. Mandel’s fitting test was applied to confirm the linearity of the obtained plots (a linear model is preferred over a quadratic one if the test value is lower than the critical value of Fcrit). The statistical significance of the differences between the rate constants was evaluated in Statistica 10 (StatSoft Inc.) using analysis of variance (ANOVA) test. Treosulfan decayed according to a one-exponential model either in the presence or absence of human liver cytosol and GSH (Fig. 2). A linear plot of the natural logarithm of treosulfan concentrations versus time was confirmed by high values of the correlation coefficient obtained in all the individual experiments (0.979–0.996) and the Mandel’s fitting test results (tests values 0.003–31.0 vs Fcrit 34.1). The determined first-order reaction rate constants are presented in Table 1. There was no statistically significant difference in the rate constants found for the samples containing the liver cytosol and GSH compared with the reference samples containing only PBS (p = 0.50 and 0.43 in the ANOVA test). In this study, we aimed to verify whether treosulfan can be metabolized via GSH conjugation, like its structural analog busulfan. For that purpose, we treated treosulfan with GSH at a concentration typical for hepatocytes (5 mM), in the presence or absence of human liver cytosol, which is the main resource of GST in the body . 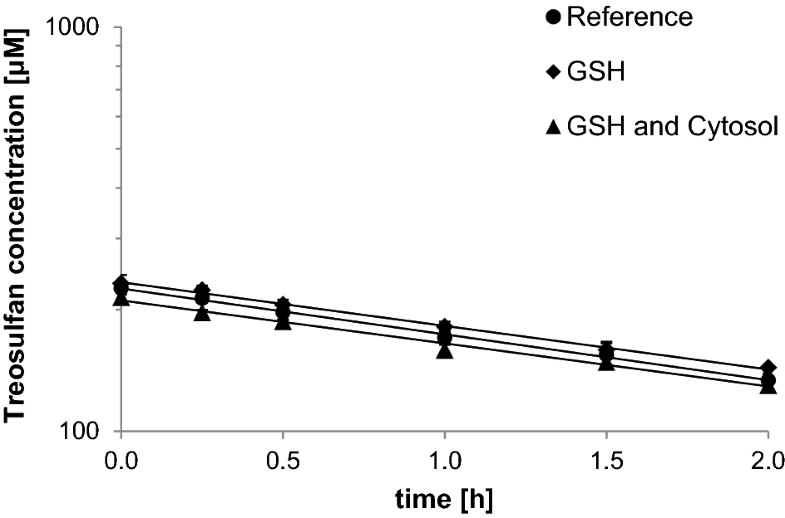 If treosulfan–GSH conjugation occurred, we expected to observe either a linear decline of the prodrug concentration in time (zero order kinetics due to enzyme saturation) or increased slope of its semilogarithmic plot due to a pseudo-first-order reaction with excessive GSH. However, neither of these scenarios took place (Fig. 2), which demonstrated that treosulfan does not undergo GST-mediated as well as spontaneous conjugation with GSH, at least at a noticeable rate. In the presence of liver cytosol and/or GSH, the decomposition of treosulfan proceeded at the same rate as in the reference samples containing only PBS (~ 0.25 h−1). This value reflected the pH-dependent epoxidation of treosulfan to EBDM via an intramolecular bimolecular nucleophilic substitution [2, 3]. Previously, busulfan has been found to react with GSH, both spontaneously and by GST-mediated catalysis, forming the sulfonium cation of GSH and releasing two methanesulfonate groups [10, 11]. 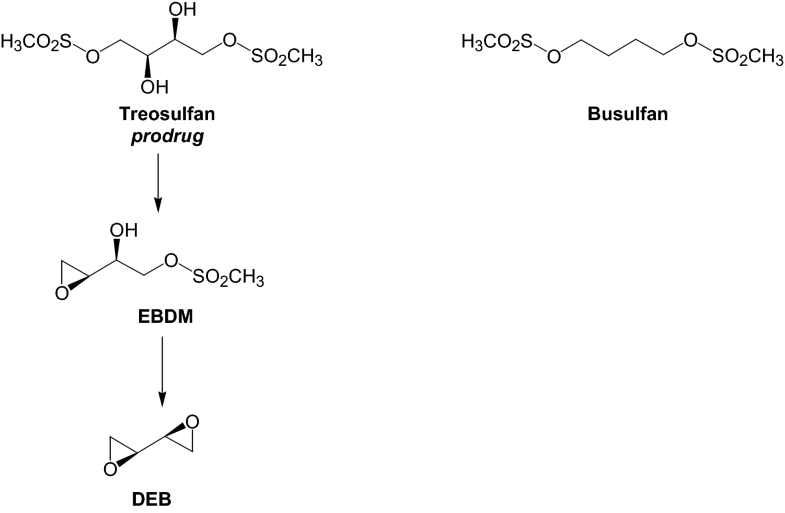 The lack of an analogous reaction for treosulfan might be explained on the grounds of the mechanism of the prodrug epoxidation to EBDM. This involves a very rapid (3.3 × 105 h−1 rate constant) intramolecular attack of the deprotonated β-hydroxy group on the α-carbon bearing the methanesulfonate group . Substitution of the latter moiety by nucleophiles present in the solution is therefore highly unfavorable, which was confirmed by the lack of effect of acetate, chloride, phosphate, and carbonate anions on the kinetics of the treosulfan conversion to EBDM and DEB [2, 3]. The findings of the present study that tripeptide nucleophile GSH does not visibly react with treosulfan agrees with the mentioned results and, in fact, provides additional support for the established mechanism of treosulfan epoxidation. The resistance of treosulfan to GSH confirmed in this study is of clinical significance. The key implication will be the independence of treosulfan clearance of GST activity and GSH stores in the body. In particular, the genetic polymorphism of GST and physiological changes of the enzyme activity with age should have no effect on the interpatient variability of the drug clearance. This is important for reaching the target exposure of treosulfan applied in conditioning prior to HSCT in very young patients, including infants [13, 14]. The other benefit lies in avoiding interactions with drugs that utilize GSH-dependent metabolic pathways, such as cyclophosphamide, melphalan, and thiotepa [9, 11]. In conditioning regimens, these agents are usually administered within 1–2 days before or after treosulfan [18, 19, 20, 21]. The lack of treosulfan conjugation with GSH may therefore prevent drug–drug competition for access to GST, depletion of GSH stores, and liver tissue injury. These phenomena supposedly occur when busulfan is co-administered with cyclophosphamide [8, 9, 11]. Hassan et al. reported that prolongation of time between the last dosing of busulfan and starting cyclophosphamide (7–15 h to 24–50 h) was associated with an increased clearance of busulfan and a lower incidence of sinusoidal obstructive syndrome. However, this kind of interaction between treosulfan and cyclophosphamide is unlikely in view of the results of the present work. Altogether, the resistance of treosulfan to GSH is expected to contribute to the relatively low hepatotoxicity of the prodrug due to saving the liver GSH stores. Here, we have proved for the first time that treosulfan does not undergo either spontaneous or GST-mediated conjugation with GSH. This property of treosulfan is clinically beneficial because it prevents interpatient variability of the drug clearance due to GST activity, GSH depletion, and interactions with GSH-conjugated drugs. This work was supported by the Poznan University of Medical Sciences, grant No. 502-14-33064130-09629. The Ministry of Science and Higher Education (Poland) sponsored the open access publication under Springer’s Open Choice option. M. Romański and F.K. Główka declare no conflict of interest.